There's a remarkable coincidence on the calendar this year, due to the drifts and ebbs between the solar and lunar calendars: Chinese New Year falls on February 14, the same day as Valentine's Day! Shall I expect a preponderance of red on Sunday, as rosy, lace-edged valentine cards mingle with vermilion lucky envelopes? Hopefully the jubilant, raucous snapping of firecrackers won't drown out the murmurs of sweet nothings between lovers in the city. Myself, I'll be looking to welcome in the Year of the Tiger, while stealing a smooch from the boyfriend! I always try to do something citrus-themed for Chinese New Year, and this year I picked some blood oranges from the local market. (Shall have to do something Valentine's-related later this week). I guess with pomegranates and blood oranges I'm really developing a thing for dramatically-hued fruit! Notice how the rind of blood oranges can have darker red patches, as if the color of the flesh inside is pulsing through. Once you slice into them, it can look like a massacre on your cutting board, although fortunately it doesn't stain like berry juices. Blood orange juice is a little tarter than regular orange juice, depending on the variety, and I was struck with the idea of making it into a curd. The recipe I used is a variation of one I found in a Donna Hay magazine, your basic eggs, sugar, and juice formula. I was surprised, though, with the addition of some butter to add a satiny edge to the curd, to find the color softening to a regular orange – not the sanguineous hue I was expecting at all. It almost looked like orange sorbet, and tasted not unlike it! To give the curd a more interesting frame than a slice of toast, I made some tuiles from my Field Guide to Cookies recipe and made some cups to hold a dollop of curd and some whipped cream. Not entirely certain what to call them – tuile cups perhaps may be the formal name, but I like the word tuile-lets. Cute, huh? 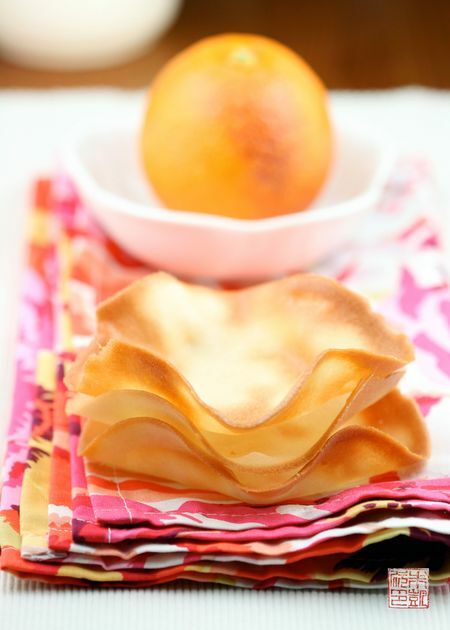 I added some almond extract to the tuile-lets which gave them a flavor reminiscent of fortune cookies – combine with the orange curd, these made for simple but satisfying way to celebrate the new year. This scale is accurate down to the gram, which is essential for you baking precision-fanatics when you're following recipes with metric measurements. I noticed my old scale seemed to hover within a 3-4 gram range, which isn't a deal breaker for most recipes but was a little irksome as I wondered why it couldn't ever settle down on a weight. Also, I have to admit that my old scale was sexier-looking with the glass platform, but I realized that the utilitarian design of this scale is actually much better: it's easier to wipe off and keep clean, the buttons are large and easy to press, plus there is a three minute turnoff delay, meaning much less chance of you losing your measurement as you're scrambling for your next ingredient (not that you would ever start baking without all your mise in its place, would you? :) ) So don't let the humble exterior deter you from its host of well-thought out features. 1. Does both grams and ounces, and can tare. 2. Has capacity up to five pounds at least. 3. Has a platform wide enough and stable enough to hold your mixing bowl with your ingredients. 4. Is easy to clean! Don't overlook this – there are some gorgeous objet d'art scales out there, but I look at them and wonder, how would I ever clean this thing? And finally, with the new year also comes another year for my blog Dessert First, which is now officially five years old! I couldn't have imagined all that would happen five years ago, and hopefully all you dear readers will follow me to see what happens next! In celebration of five very sweet years, I finally have a banner – long, long overdue! Many thanks to Kaytlyn of Beneficial Design for creating this luscious looking header! I hope to continue welcoming you all here through my new front door! < span style="font-size: 14px;">Add in vanilla extract and egg whites and beat until combined. Sift flour over mixture and mix on low until combined. Cover batter and let rest in refrigerator for about 1 hour. When you are ready to bake the cookies, preheat the oven to 350ºF. Line several cookie sheets with silicone baking mats. 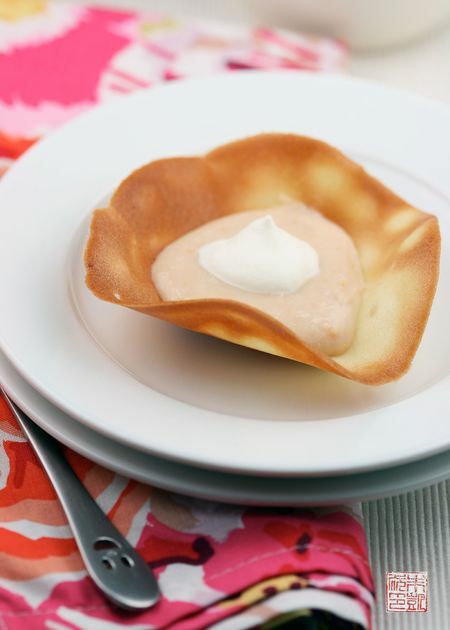 Spread tablespoons of batter onto the cookie sheets, spacing them about 2 inches apart. Be sure to spread the batter as thinly and evenly as possible: If it is too thick it will not bake properly. Use a moistened fingertip to smooth the batter out. Bake to 8–10 minutes or until the edges turn golden. 8. Cool sheets on wire racks. If you want to shape them, you must do so quickly once they are out of the oven before they harden. If the cookies harden before you can shape them,return them to the oven for 30 seconds to warm and soften them. Combine orange juice, lemon juice, egg yolks, and sugar in a medium saucepan. Cook over medium heat, whisking constantly, for 8-10 minutes until sugar has dissolved and mixture has thickened. Remove from heat and stir in the butter a little at a time, stirring to fully combine. Pour curd into a container and press a piece of plastic wrap to the surface. Refrigerate for an hour or so until it has cooled and thickened to a spreadable consistency. delicious! happy valentine’s and happy chinese new year! Wow, 5 years! Congratulations! 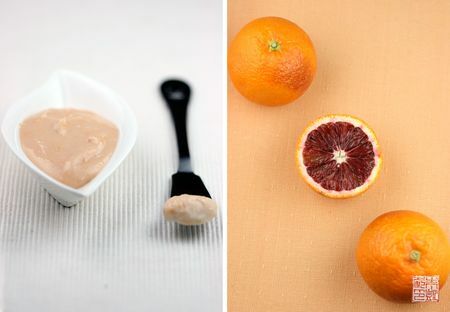 I remember the one time I made blood orange curd – it turned a little browner than it did orange, which was sad. It tasted good though! And I love that you called them tuile-lets 🙂 Have a wonderful valentine’s day / chinese new year! I love the coulour of blood orange ! It’s surprising ! what kind of lighting to you use for your photographs? they are absolutely gorgeous! i am getting into food photography but can never find really good lighting. do you use lightboxes, lamps or natural lighting? happy chinese new year/valentine’s day! Congratulations, I love your new banner! The blood orange curd tuile-lets look fantastic. Beautiful tuilles and curd as well! Simple and elegant – like a lotus floating on a pond. 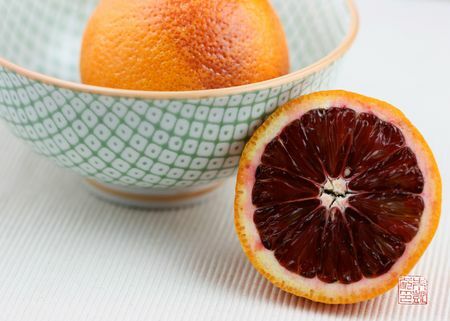 Blood oranges are my favorite and I’ve been looking for a creative way to use them in a dessert – here it is ! I have a blog too, i loooove cooking. Gong Xi Fa Cai Anita! Thanks for your delightful recipe, very unusual. A scale is definitely the way to go when baking! I don’t know why people are so relunctant to use them! I love the idea of a tuile-let. So cute! I’ve been anxiously awaiting blood orange season and all the blood orange dessert post out in food blog land are making me so happy!